FOR NINENEETH-CENTURY American Catholics, discussions of religion and science summoned the specter of one man: Galileo. Critics of Christianity frequently invoked the Catholic Church’s persecution of Galileo as evidence that science and Christianity did not mix. Such reminders frustrated late nineteenth-century Catholics. Now middle class and eager to leave the poor, immigrant communities in which they were raised, they wanted to play a larger role in the political and intellectual life of the United States and knew that this depended on Protestant Americans setting aside negative stereotypes of Catholicism. One of those stereotypes was that Catholics were anti-science. So Catholic intellectuals were quick to remind American audiences that the Galileo case was the only instance when Catholic ecclesiastical authorities had condemned a true scientific theory. Catholics also insisted that their church actively encouraged scientific investigation. One proponent of this view was priest John Augustine Zahm (1851–1921), an Ohio native. Zahm rose quickly from a rural log schoolhouse and became codirector of the science department at Notre Dame at age 23. In addition to his keen intellect, Zahm had a penchant for self-promotion. He emerged as the leader of a group arguing that Catholicism allowed “perfect freedom of investigation according to the principles and methods of science” without interference from “petty dogmatism.” Zahm and his colleagues knew they had to address the theory of evolution head-on. Catholics actually had an easier time with the subject than some Protestants did. Because Protestants saw the Bible as the sole source of religious authority, apparent contradictions between science and Scripture could easily become a source of angst. By contrast, Catholics took solace in holding that the church was the final arbiter of truth. Throughout the nineteenth century, evidence from geology repeatedly challenged a straightforward reading of the biblical creation story. These discoveries suggested that the earth was far older than the 6,000 years accounted for in Scripture and that plant and animal life seemed to have developed more gradually than in six days. Long-standing precedent existed in Catholic tradition for viewing the days described in Genesis not as 24 hours, but as long, indefinite periods of time. This response to geological discoveries at first provided a template for Catholic engagement with theories of evolution. Even if Darwin’s theory appeared inconsistent with the Bible, American Catholics believed the church’s teaching would bridge the gap. Because the Vatican initially refused to take a position, many Catholics felt they had little to fear. Virtually all Catholics agreed that humans were specially created, though they disagreed about the development of lower species. 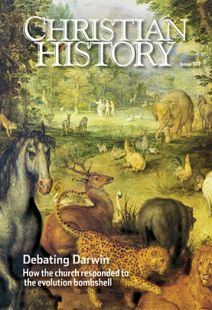 Additionally, few Catholics had any patience with theories that expanded evolution beyond biology and into the realm of society (see “Survival of the [social] fittest,” pp. 19–21). The literal meaning of Genesis? Catholics who accepted the theory had strong grounds for thinking the church would not object. Beginning in the 1880s, Catholic intellectuals began to highlight passages from the writings of Augustine of Hippo (354–430), such as The Literal Meaning of Genesis, where Augustine advanced a model of the natural world that some thought resembled modern understandings of evolution. Catholic scientist John Gmeiner went so far as to call Darwin Augustine’s “disciple.” Given Catholic emphasis on the authority of historical church teaching, this suggestion added considerable weight for many. By the 1890s the leading Catholic proponent of evolutionary theory was without a doubt the well-published Zahm. In his 1896 Evolution and Dogma, Zahm championed it with rhetorical zeal: “Evolution, as taught by St. Augustine and St. Thomas Aquinas, is the most reasonable view, and the one most in harmony with the explicit declarations of the narrative of creation.” Zahm went further than other Catholics in saying the creation of the human body (though not the soul) through evolution was “quite in harmony” with the teachings of these Catholic giants. This was a step too far for many. It meant that the body was somehow distinct from the soul. But Catholics had long believed in the unity of body and soul, a position advanced most forcefully by none other than Aquinas. Zahm was challenging beliefs about human nature that had been dominant in Catholicism for centuries. This all coincided with larger debates about Catholic faith and modern thought. Some Catholic critics thought Zahm was more serious about evidence from natural science than about long-standing church teaching. And many American Catholic leaders who supported his efforts were standard bearers in an overall “Americanization” of Catholicism—a trend that displeased the Vatican. For instance, one of Zahm’s most outspoken supporters, blustery archbishop John Ireland—“the consecrated blizzard of the northwest”—barnstormed his way across the United States championing the separation of church and state, public school attendance for Catholic children, and a host of other positions that more conservative Catholics found unpalatable. David Mislin is a lecturer in the department of history at Boston University.